Another year has passed and as the winter slowly warms to spring we are all looking forward to another field season on the trails in the North Country. Once again I am happy to announce an outstanding collection of individuals to run the one-three week programs, Custom Crews, and weekend work parties in Maine and New Hampshire. 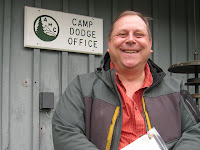 I have been working with AMC Trails and the Camp Dodge Volunteer Trail Crew Programs since 2001. Originally from New Haven, CT, I attended Unity College in Maine and have a degree in Adventure Education/Art. My main interests have always been working with people and and contributing solid effort towards beneficial goals. The AMC Trails Volunteer Programs allow me to work with amazing people that really contribute to the recreational and natural resources in the northeast. I am very much looking forward to another safe, successful, and productive summer season. I wish the Camp Dodge Staff for the 2009 season the best of luck. and I hope to get on the trails with many of our volunteers this year. Originally from Michigan and many other non-mountainous places, I’ve returned to Camp Dodge for my second season. Though I’ll spend much of my summer in a tiny office with the entertaining Alex DeLucia, I thoroughly enjoy living at Dodge, being outside, and helping all the volunteer programs run smoothly. My past experiences often seem to lack a specific theme, yet all have been fascinating and full of learning. Some historical highlights include working with deafblind students, inner-city youth, a BA in Community Leadership, farming, and travel in Latin America. More recent highlights include playwriting and directing, gardening with youth, more travel, and adoring my cousins in Laingsburg. Some of my fave things I’m looking forward to at Dodge this summer will be the garden and the moose; but hopefully not together. I’ve grown up in both Maine and Vermont, yet somehow I’ve managed to not do much exploring on foot in the Whites until my first season at the AMC. Last summer I worked as a Crew Leader for the Dodge programs, and this year I am back as the Project’s Coordinator. I’m excited for the new challenges this position will offer, and to see returning volunteers. I went to Bucknell University and graduated with a BA in Environmental Studies in 2004. Since then I’ve traveled back and forth across the US a couple of times pursuing seasonal outdoorsy job and new mountains to explore. I’ve worked for the Maine Conservation Corps, Arapahoe Basin Ski Area, and raft guided in Oregon and California. I skied and built houses in my spare time in North Lake Tahoe, worked Colorado as a camp counselor/horse wrangler, and have done a couple seasons as a Ski Patroller at Killington Ski Resort. I’m officially addicted to both skiing and trout fishing. Expect to see me with my fly fishing rod this summer. My two greatest passions are the mountains and cooking and I am so excited to find a job that compliments both. I am formally from Saranac Lake N.Y, but have been living in the “live free or die” state for several years. During those years I spent two seasons with the AMC on the professional trail crew, so I have an idea of the appetites you will work up. I am working on finishing a forestry degree from UNH. I love the Friday Barbecue and <?xml:namespace prefix = st1 />Camp Dodge because it brings trail workers together and allows them to share their amazing experiences. "This will be my second year at Camp Dodge, this year stepping it up to Head Leader. I can't really think of any place I love to be more than the White Mountains, and especially Camp Dodge. 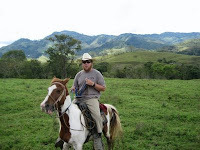 In the rest of my life I'm a student at Green Mountain College where i study Adventure Recreation. In the last year I had the opportunity to attend a NOLS backcountry snowboarding course in Idaho. I can't wait to apply the new things i have learned to my work at AMC and to just get dirty and get outside. Im super excited for this season and look forward to new projects and new participants." Hey! I'm from Atlanta, Georgia where I attend Agnes Scott, an all woman's college. I'm finishing up my degree in Political Science and Spanish and will be free as a bird in May. During the year I keep myself busy playing rugby, running cross country and working with my school's environmental group. I love reading, cooking, making other's eat the food I cook, sewing and speaking Spanish at every opportunity. As a kid, I grew up exploring the Blue Ridge Mountains during the summers. During high school I decided to venture outside of the South and spent a month in Glacier National Park as part of a high school crew with the Student Conservation Association. The challenges of trail work and simplicity of backcountry life immediately had me hooked. Almost every summer since then I've been off exploring new mountains and different types of trail work. I found the White Mountains through the Randolph Mountain Club where I was on their trail crew for 2 years. I can't wait to be back in the Whites and I'm excited for the opportunity to work hard, get dirty and play in the mountains! Hey! I'm from Boston, and though I've grown up in the city, I've spent lots of time up in the White Mountains hiking, camping, and just enjoying the outdoors. I volunteered on AMC trail crews the past two summers and had an absolute blast and I can't wait to get out and lead crews this year. I’m finishing up my senior year in high school, so three months in the mountains will be a perfect break from school before I head off to college in the fall. See you all at Dodge! Hey everyone, I am wicked excited to be apart of Camp Dodge. I grew up outside of Boston, spending most of my youth playing and exploring in the woods near my house. I now attend Plymouth State University and i am studying to become an Adventure Educator. When i am not being the best student i can be i am skateboarding, snowboarding, mountain biking, climbing, hiking, slack lining and the list goes on. Basically you give me a sport or activity that puts me outside and i will love it. I spent last summer working on a trail crew out in the rockies. I really enjoy working with people am am looking forward to an exciting year, WOOHOO! Hi! I am so excited for the upcoming season at Camp Dodge! As I was looking around for a fun job for the summer, a friend recommended that I check out the AMC. When I saw the trail crew leader position still posted on the web, I jumped at the chance to spend the summer outdoors, do some challenging work, meet new friends, and enjoy the mountains of the Northeast! With California and Colorado being the two places I call home, I look forward to acquainting myself with a new set of mountains and ecosystems. I attend Brown University, in Providence, Rhode Island, where I study ecology and evolutionary biology. The science nerd side of me will surely come out on our adventures this summer! Other than staring at plants and searching for birds and bats, I love hiking, backpacking, running, reading, and learning how to cook. Can’t wait to meet you all this summer! Yo yo yo!!! This will be my first season working with the trail fixing, water-barring, bog-bridging organization better known as the AMC. Although born and raised a true Mainer, I've always had a sense of adventure, which has taken me all around the country. I have loads of great memories and experiences playing around in the Whites—which makes me super excited to get to spend the summer at Camp Dodge. Being a very independent youth, I decided to skip high school for no other reason than I thought it was unnecessary, and jumped right into the college life—which will most likely make me the "youngster" on the staff. I currently attend Unity College in central Maine, where I still do not have a declared major, but am leaning towards Parks Recreation and Ecotourism. I spend every microscopic bit of free time gaining elevation via the rocks (aka Rock Climbing). Whether it be Aid, sport, Trad, gym, or ice climbing I absolutely love it all no matter what the grade is—it allows me to express my creativity both mentally and physically. My other hobbies include Mt. Biking, Backpacking, Trail-Crewing, soccer, Primitive skills, cribbage, slacklining, unicycling and getting dirty playing in the mud!!! Yee Hawwww!!!!!!!!! 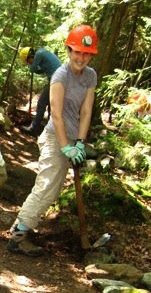 AMC Volunteer Trail Crews are also led by a collection of talented and energetic Trails Volunteer Leaders. These leaders have been long-time volunteers in our programs that have been trained to be a trail crew leader. You may get an opportunity to work with one of them on an adult crew or weekend program in the White Mountains, Baxter or Acadia. Hi I'm Julie from Somerville, MA and I'll be a volunteer co-leader for Week #2 in Acadia (Sept 6-12). This will be my 7th year taking art of the AMC's Volunteer Trail Program. My first 4 years I signed up as a participant on Classic Crews in Maine and New Hampshire's White Mountains. The last 2 years I co-lead for the volunteer vacation crews with AMC staff in Baxter State Park, and this year I'll be co-leading a crew in Acadia. I'm also an AMC Trail Adopter and and 4-season volunteer leader for the AMC's Boston Chapter Hiking & Backpacking Committee. My day job includes web design, illustration and tea drinking. My interests other than the outdoors include reading art & design blogs, photography, gardening & local farming, cooking, making journals, traveling abroad, recycling & reusing, and singing to great music despite my voice. 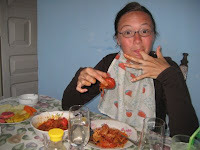 I'm looking forward to meeting & working with the Week 2 crew... and to that sweet seafood dinner. Hello. 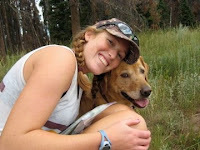 I am an active AMC and US Forest Service Trail Adopter and I have been working on trails since 2001. Working on trails gives me the opportunity to to fulfill a life-long dream to be a forest worker in the mountains. As a volunteer co-leader for the volunteer programs I get to share my skill, experience and enjoyment with others. This season I will be helping to lead National Trails Day on June, 6th and many other weekend programs throughout the summer. Hi! 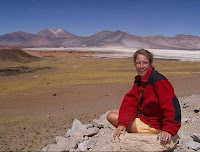 I'm originally from the Netherlands where the highest "mountain" is 1053 feet high. After moving to the Boston area ten years ago I quickly got hooked on hiking in the Whites. What started as a hobby turned into a passion and since then I've spent many months on the trails of the Whites, the Rockies, and the Andes. When I am not hiking or backpacking, I divide my time workwise between EF (a Swedish company specializing in travel and student exchange) and Nuestros Pequeños Hermanos (an orphanage in Nicaragua). 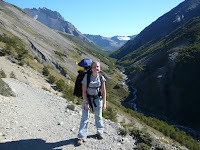 After having volunteered in Baxter's trail crew the last 2 years, I will volunteer this year as a co-leader with Hannah in the Whites (Young Members Alpine Crew, July 12-18) and with Nick in Acadia National Park (September 20-26). I look very much forward to the "volunteer trail crew weeks': getting to know you, spending time working outdoors and above all: having a good time together! Former AT corridor monitor outside of Hanover NH, worked with the Norfolk Ct Land Trust on maintenance projects and trail development, 10 plus years trail work experience with the Connecticut Section of the GMC, active with the AMC out of Dodge since 2001 working in Maine and New Hampshire. Beginning third year as a Volunteer Trail Crew Leader. 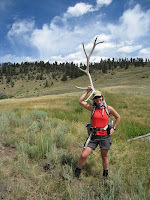 Like to remain active and look forward to a good trailwork season. Hi, this is my second year as a trails volunteer leader and I’m from Montreal, Quebec (Yeah, I know the great white north! and I don’t say eh!). I’ve been a trail adopter since 2001 and an adopter region leader since 2004 (Pemi-Region). I currently have a section of the AT (Twinway). When I’m not out working on the tails but still volunteering, I’m also an Information Volunteer and an Alpine Steward on Franconia Ridge (Probably some more things too numerous to mention). I will be co-leading 2 consecutive week (Aug 9-14 Camp Dodge & Aug 16-21 Baxter). It will be nice to be able to hang out in the woods for a couple of weeks. I have my fingers crossed for good weather. My real job is working for an IT department in a big multi-national as a Data Analyst. It’s a good thing I found a hobby that doesn’t involve sitting at a desk 8 hours a day. Looking forward to hitting the trails.